"Tucked away in a lovely established neighborhood, this completely updated one-level home has easy access to the I-49 corridor. Amenities include: 9 foot ceilings, elegant crown molding, recessed lighting, new (real) hardwoods, plantation blinds, Electrolux appliances, gorgeous granite counters, wood burning fireplace, 3 car tandem garage with 378 sq ft office above, security and irrigation systems, and abundant storage throughout. A private park-like backyard with lavish landscaping includes 3 spacious entertaining areas. In highly rated Har-ber High School district. Move-in ready! Come see!" 5306 Bryant Place is located in a great, established neighborhood (SUTTLE ESTATES) in Springdale (close to the NWA MALL) on an amazing park-like setting. 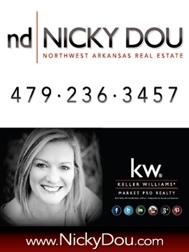 Convenient to all of Northwest Arkansas! Home in Springdale on 2+ acres with Beaver Lake View! Springdale Home For Sale in Renaissance | Moving to AR?